The premium options between Bangkok and Hong Kong are pretty outstanding for a 2.5 hour flight. 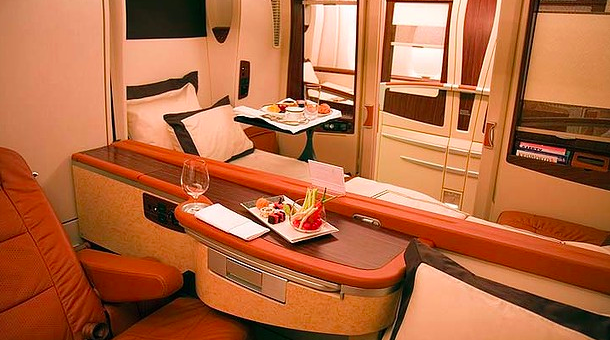 You can fly Emirates' A380 service (with shower suite) for a cash rate of around $700 USD. 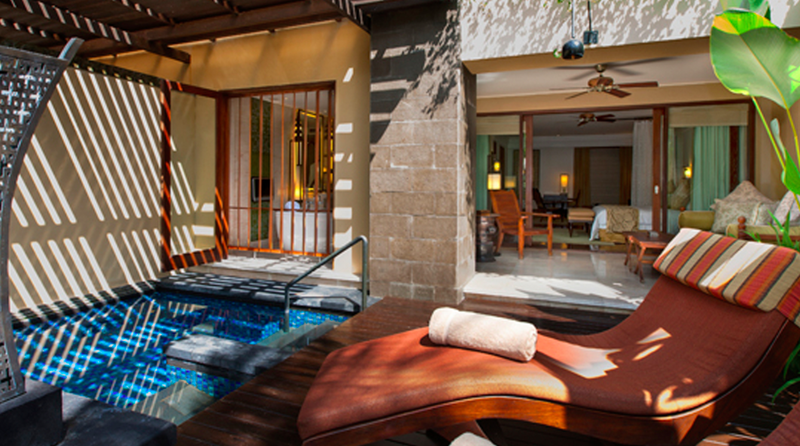 Cathay Pacific offers a first class cabin on their 777 service and Thai offers their 747 first class. 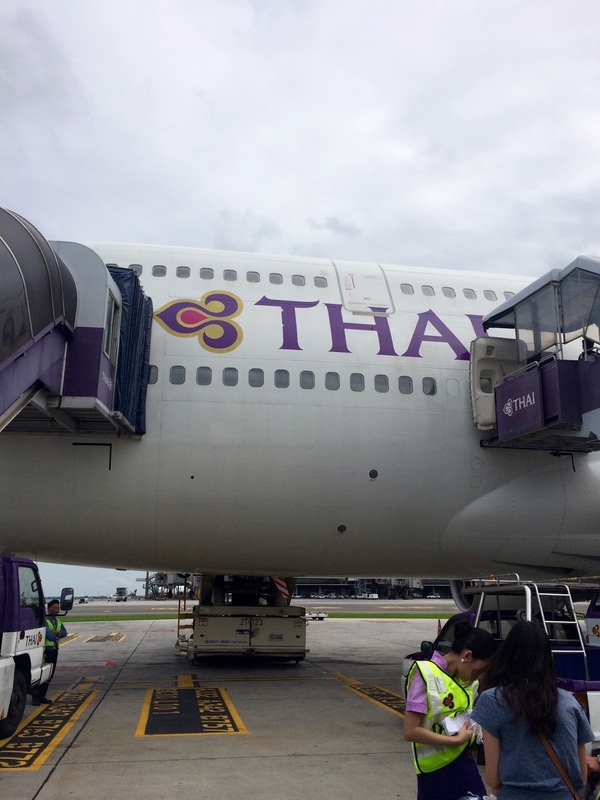 I debated between the Emirates and Thai offering but ultimately opted to save the cash and burn 70,000 United miles for the Thai flight and the spa experience. After a great massage, we were soon climbing the stairs to the nose of the 747-400 that would be taking us to Hong Kong. Thai Airways actually has two different first class seats. 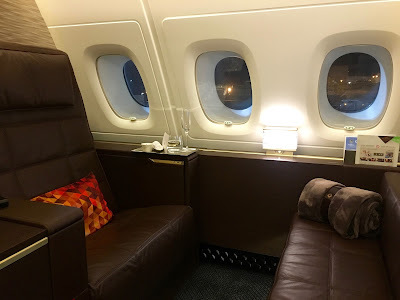 These aging shell seats and "suites" on their newer 747s and their A380. For this short hop, Thai flies the older planes. These 747's are a total throwback but still in decent shape. The seats are old and not very private but very comfortable for a short flight. We arrived at BKK three hours prior to our scheduled departure to Hong Kong after a quick and inexpensive ($12 USD) cab ride . It was a weekday afternoon and the airport was relatively quiet. 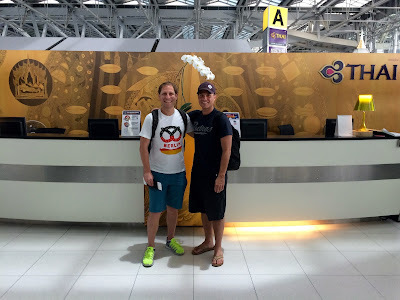 We made our way into the terminal and turned left - all the way to the end of the main hall where Thai Airways First Class check in is located. There was no one in line and we were very politely asked to have a seat and presented with cold towels and iced tea while check-in formalities were processed. A few minutes later, boarding passes and lounge invitations were handed over and the agents were kind enough to snap a few pictures of us before escorting us through immigration. Suvarnahbhumi's gates are different in that you go down a set of ramps from the retail level, have your passport and boarding pass checked, and then enter kind of a holding area prior to departure. When we approached the "gate" there was a huge line of people making their way down the ramp to the holding area. 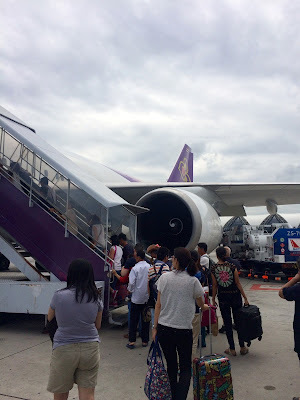 By the time we had made our way through, boarding had already begun so we boarded immediately and were on the plane in about 2 minutes. It was nice not to have to wait as the holding area has limited services and gets pretty crowded prior to boarding a 777. 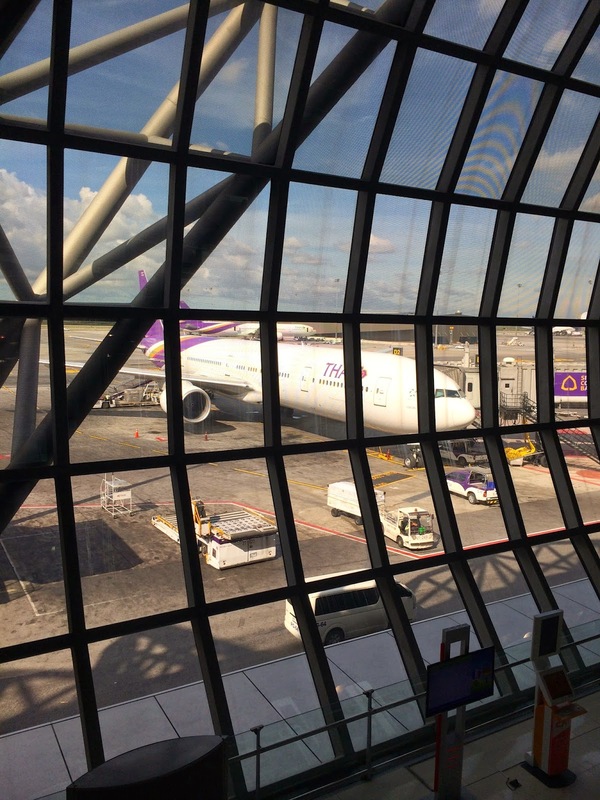 I really like the look of Bangkok's Suvarnabhumi airport. There are rows upon rows of check in desks for airlines headed to exotic locations all over the world. The people are just as diverse headed home, to their holiday, on a business trip, or just transiting through. 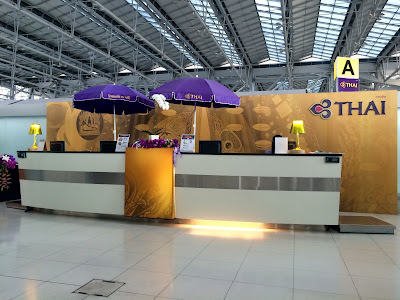 Thai Airways has their premium check-in for first and business (Royal Silk) class passengers in row A which is all the way to the left upon entering the great hall. We made our over and were immediately shown to a check in desk. The check-in process is unique in that there are umbrellas at each station along with cubes where you can sit down if you'd like. 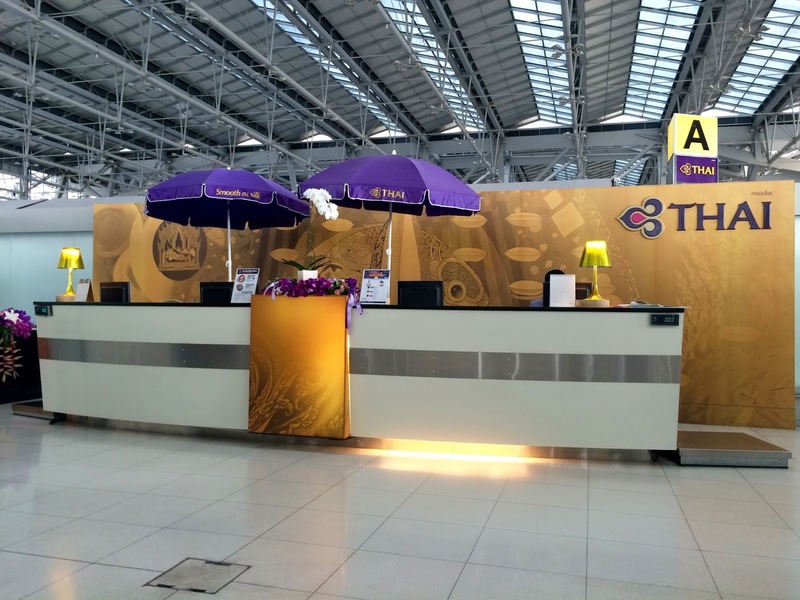 The color scheme is decidedly "Thai Airways Purple" which I like a lot.